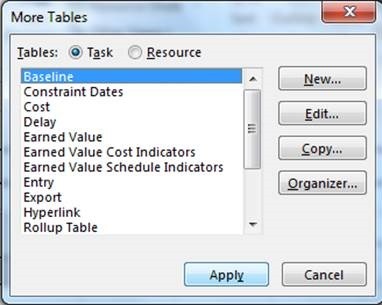 Select the ‘Baseline’ Table and click ‘Apply’. You can see at present the ‘Baseline Duration’ is 0 Days, the ‘Baseline Start’ and ‘Baseline Finish’ display ‘NA’, ‘Baseline Work’ displays ‘0 hrs’ and ‘Baseline Cost’ displays ‘$0.00’. This is because at present there is no baseline. 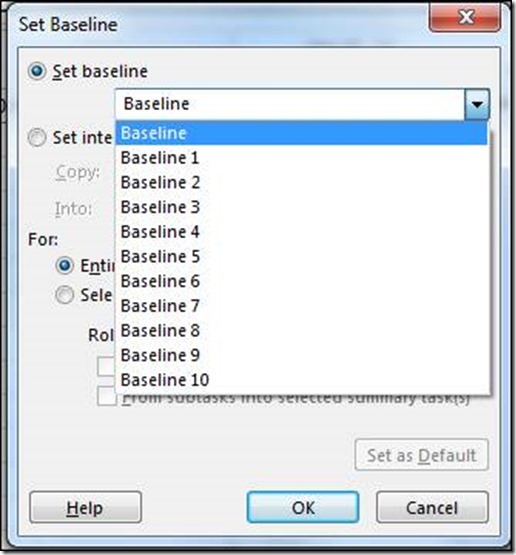 From the ‘Set Baseline’ dialogue we can select a Baseline. 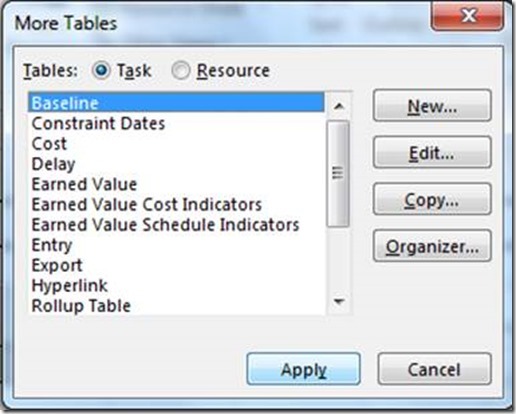 We can see in the ‘Set baseline’ dropdown menu the 11 available Baselines that we can select. 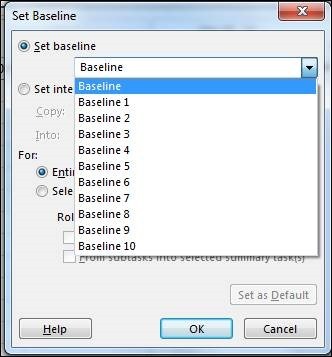 However the Baseline that drives the variances and report by default is what we describe as ‘Baseline 0’ which is just ‘Baseline’. (It’s commonly called ‘Baseline 0’ in the industry to differentiate it from other Baselines). With Baseline selected (it’s the default) we can click ‘OK’. Baseline 0 is now set. If we look back at the ‘Baseline’ table we can now see that all the fields have been populated. 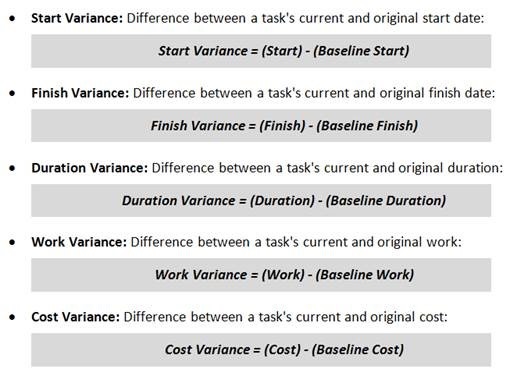 Essentially for each task: the ‘Duration’ has been copied into the ‘Baseline Duration’, the ‘Start’ has been copied into the ‘Baseline Start’, the ‘Finish’ has been copied into the ‘Baseline Finish, the ‘Work’ has been copied into the ‘Baseline Work’ and the ‘Cost’ has been copied into the ‘Baseline’ Cost. To visualize the ‘Baseline’ on the Gantt Chart; from the ‘Bar Styles’ section of the ‘Format’ ribbon click on the ‘Baseline’ dropdown and select ‘Baseline’. You will then see a grey bar side by side with your blue bar. The grey bar represents the ‘Baseline’; the blue bar represents the current schedule. I am now going to update the schedule. 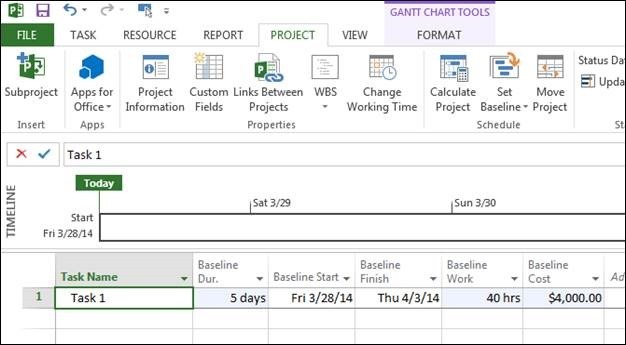 For example; the resource assigned to the task informs me that the task will now take 7 days as opposed to 5 and he started the task on Monday 3/31 as opposed to Friday 3/28. 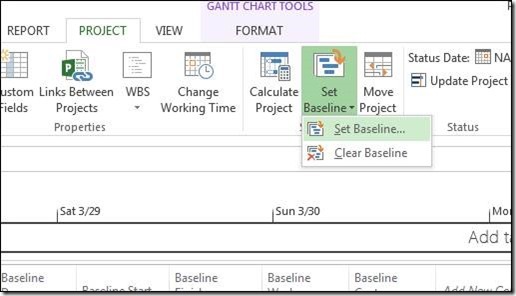 The changes are reflected on the Gantt chart, the task is pushed out but the Baseline stays the same. 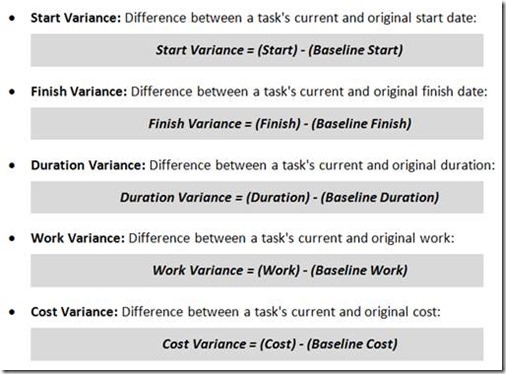 If you review the ‘Variance’ table you can now see these changes reflected. 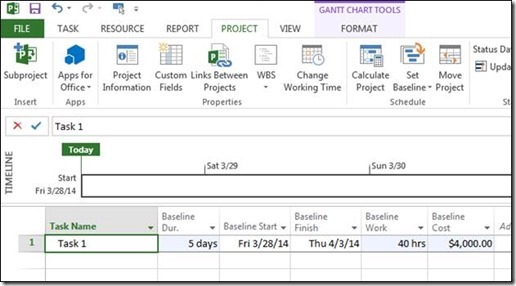 Project variances measure the difference between the current schedule and the baseline. In other words, project variances tell where the project has deviated from the original plan before the project started. 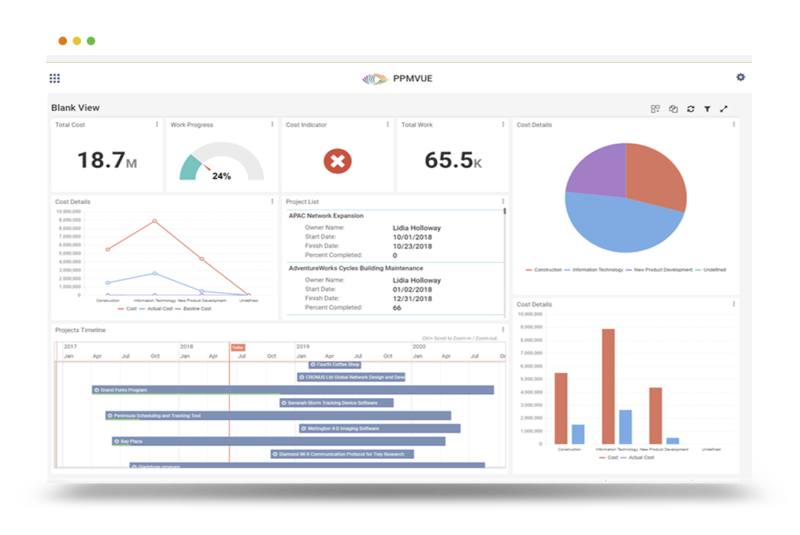 Negative variances indicate where the project is performing better than the original plan, and positive variances indicate where the project is performing worse than the original schedule. Being able to make these comparisons is an essential part of scheduling. 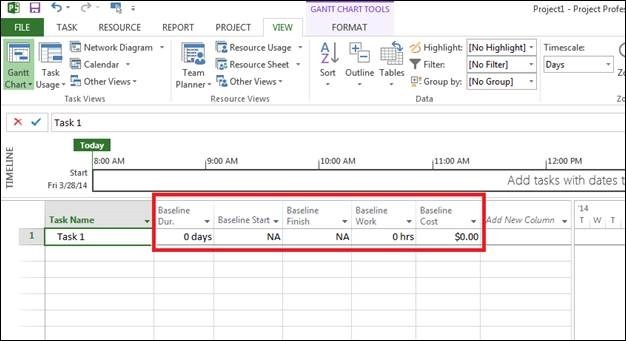 Capturing a baseline allows a user to compare back to what they initially thought would happen and how much the activities would cost. 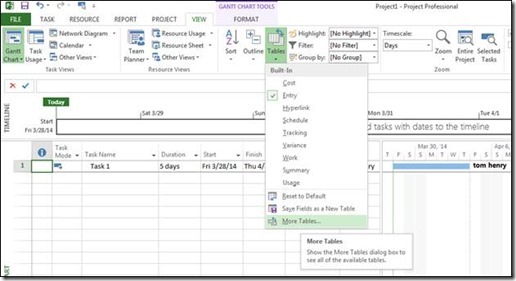 It also enables a Project Manager to see where a project deviated and perhaps learn from what happened. 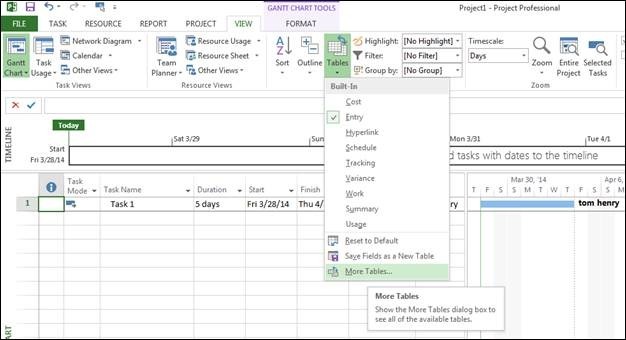 This entry was posted in Microsoft Project, Microsoft Project 2013, Project Management, Scheduling. Bookmark the permalink.